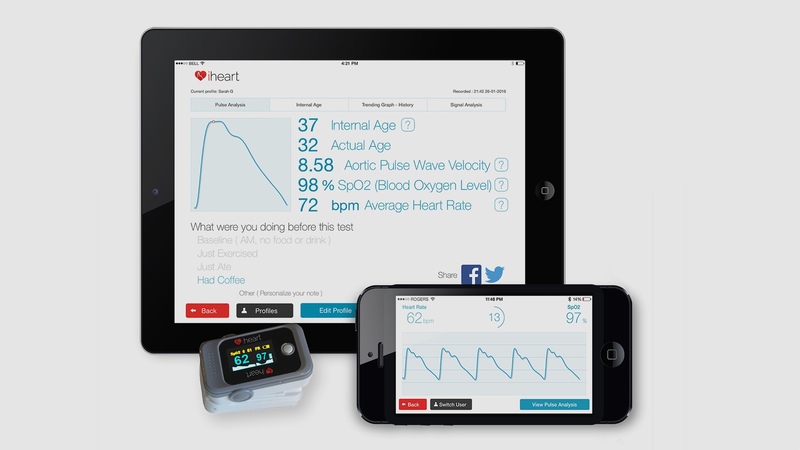 Is iHeart's medical metric the next health revolution? For many people the most important data collected from their wearable device is their step count or calorie goal. For others, getting that 30 minutes of daily active time is essential. But what about the internal age of your body? The stiffness of your arteries? Or the suppleness of your core? It may not be the talk of fitness magazines and government ads, but iHeart – a Canadian start-up – believes it's the most important gauge of your overall health. iHeart is a family affair, the brainchild of Dr Jess Goodman, who came up with the iHeart after a promise made to his tai chi teacher. The Taoist monk asked Dr Goodman to research the health benefits of stretching the core, and Goodman stumbled onto a new metric: Aortic Pulse Wave Velocity, a measure of the stiffness of your arteries. After seeing the prototype, his daughter Sarah Goodman also got involved, and the product launched on Indiegogo back in 2014.
iHeart is a wireless sensor that's placed on the finger and connects to a smartphone app. It hosts a bevy of sensors on the inside, which are commonly used to read heart rate from the finger. And Goodman Snr says that while the information that can be gained from them has always been apparent, it's not been leveraged – until now. "We want to be transparent and have people ask how they do it. We show your pulse wave and where this wave is appearing in the pulse. And every single person has a three-way pattern in their fingertip pulse. Primary wave appears when the heart beats. The reflected wave comes as a second peak and when the heart relaxes and the aortic valve closes, there's a third peak. It's not hard to get and it's really useful." You may wonder why no one else has used this magic data, but they actually have. Withings' scales measure aortic stiffness through the feet, although it's not translated into a body age as per iHeart. "With iHeart, you can see the changes really fast, because you can see exercise lower the pulse rate velocity score," said Sarah Goodman. "We have some professionals using the tool and they will use it for 30 seconds on a client and do the test right after, and there will be a big drop, based on how your body reacted to that. Just that, for a personal trainer, to show someone that improvement is such a good motivation to keep them going." "After the accident I had a body age of 85, according to the device. I started doing yoga and it was only that that started the movement back to normal." "One of the critical things about yoga and tai chi is to work along the spinal axis to mobiles the spine and ribs, so you can give the internal organs the best possible health. If you have a mobile spine and rib cage, your diaphragm muscles will drop and massage the spleen and liver," he explained. "With better expansion you get improved airflow to the lungs, blood and heart. The significant thing is that aortic stiffness is linked to the risk of cognitive decline and dementia," Goodman continued. But while aortic stiffness and its link to heart disease, chronic illnesses and dementia is proven, the link that Goodman's keen to make to yoga and tai chi is not. The Goodman's desire to link aortic stiffness to yoga is understandable – the metric is more or less unknown to the public, and associating it with yoga makes it relatable. But by Dr Goodman's admission, few physicians would recognise his links to the ancient practices of yoga and the health benefits he claims. "There's proof that show that exercise improves aortic stiffness and there are studies that show the stiffer the aorta that more likely you will suffer cognitive decline and dementia. The next step is to provide evidence that exercise that works the spinal axis decreases cognitive decline and dementia – and that's still to come. "I am on very shaky ground, I don't have a lot of evidence for this, and it's very empirically based. However, it's a bridge between this ancient knowledge that's the basis for yoga and tai chi and this modern scientific knowledge that aortic stiffness is a measure of overall health," he said. So what does Goodman – as a GP – think of the latest devices from Fitbit, which measures VO2 Max as a method of gauging the overall health of the user? "It's great that Fitbit are offering VO2 Max. We're not looking at that, we're looking at this new metric: core mobility, and it's never been used before and unfamiliar to most people, until you link it back to the underlying concepts of yoga and tai chi." "But simply following activity levels is not going to lead people to change their habits and improve their health. Our goal is to give people a metric which will be very responsive to lifestyle changes which will show overall health and lead to longer life." We've been using iHeart in the office, and thankfully it's given us a clean bill of health with pleasingly low internal ages. However, when we saw it in action two years ago at SXSW, we saw iHeart deliver some uncomfortable internal age estimates to delegates who queued for a trial. And that's the powerful thing about iHeart – it doesn't sugar coat with friendly made-up metrics or obscure scores. If you're 35 and iHeart delivers an internal age of 50, that hurts. "The making money part isn't important, it's about helping people," said Sarah Goodman – which is admirable given that her father, by his own admission, has invested over $1 million into the development and marketing of iHeart. "The $199 price is too high to get it into enough people's hands and we know that. We're releasing our Android version in December, which will be a big help. Our main goal is to get iHeart to more people."